I believe we are watching the creation of a great band. Unfortunately, I also believe they are in a larval stage at the moment. Clap Your Hands Say Yeah's self titled debut was a fantastic album - incredibly solid, with an original sound yet with a catchy punch that made them nearly irresistible. They deserved all the hype and fame they got, despite becoming a sort of punching bag for heartless indie-deniers who didn't want to admit they were having fun listening to "Is This Love?". Well, the new album is here and I'm afraid it's nowhere as good. The tracks on this album seem to be one of two things: too much like the old album, or too awkward a step in a different direction. The "oldie" tracks are okay, but seem alien and isolated away from their natural habitat, the self-titled album. As for the new sounds, well it's not that they're getting into trip-hop or anything - it's more of a tonal change - but it sounds wrong and, strangely, out of tune. Whichever way they go, it sounds like a misstep; the drunken piano of "Love Song No. 7" sounds as out-of-place as the slightly dance-punk "Satan Said Dance," which overstays its welcome and has to be asked to leave. No, this isn't their Kid A equivalent, nor is it their White Album, although the latter is a closer fit. 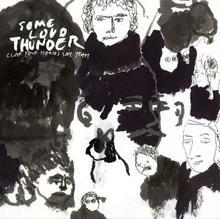 Some Loud Thunder's scatterbrained creativity is like adolescent experimentation, and while the results are not really bad, they seem like they're only half-baked, yeasty and moderately poisonous to consume. So why am I hopeful? Why do I think there is a great band twitching in this sophomore slump cocoon, waiting to burst into flight upon glorious platinum wings? Well, their first album for one thing - but also, there are two songs that make me hold out hope here. The first is "Emily Jean Stock," which has been available for a while, and the second is "Five Easy Pieces," the final track. These tracks show not just experimentation, but growth - an understanding of their sound, their strengths, and what they can do with them. But if you listen, they are unlike anything on the previous album. Listen to the drum kit, the samples, the little flourishes... this is how it should be - new, different, and better. I think this is reason for optimism. So go ahead and pick up the album, you can get it now at their site, but for your consideration, here are what I think are the two best songs on it. Here's "Emily Jean Stock," and "Five Easy Pieces,"(fixed) by Clap Your Hands Say Yeah. Edit: Damn, my "Five Easy Pieces" was all messed up, and super big too! I've repaired the file and it's ready for you to download now. I should have noticed that, 15mb for a 6 1/2-minute song? this one? damn! really get me going. hey guys i need people whom i can share my music with specially the passionate ones. away from their natural habitat, the self-titled album. Merci beaucoup. Je m'interesse votre article.